Amanda Pidgeon is a teacher at Hancock High in Kiln, MS. She teaches English 2, and AP Language and Composition. And she is a very clever lady! She has a literature project called "Write On!" 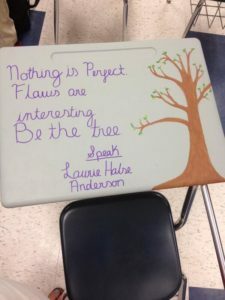 that combines books with art, and helps tame a perpetual classroom problem. She tweeted these pics to me the other day. She told me, "It's based on changing desks covered in graffiti into something you actually want to write on. The students chose a significant life-changing quote from literature and wrote an essay about the quote. 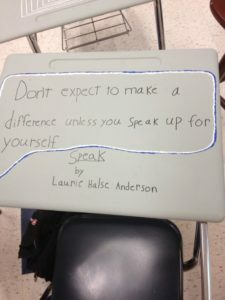 The essay gave the big significance of the quote. Then they decorated the desks to accompany the essays. " She said the desks get repainted every couple of years. Amazing, right? Why couldn't I have had an English teacher like this when I was a kid? Bookstore Events and Book Awards, Oh My!!! Since Laurie is running around like a Mad Woman, and being true to her inner Mad Woman in the Forest, I thought I would share, once again, her bookstore schedule for this weekend! Yes, it is time for her to travel to Philly for NCTE (no, she is NOT packed yet!). Besides the wonderful conference, she is scheduled to appear tomorrow (Friday) night at a Public Event at Doylestown Bookshop from 7PM until 9PM!! Can you be there? If you are in the area, please stop in and say hello! She would LOVE to see all her friends! On Saturday, Laurie will be doing conference book signings and an Author Blog Panel: Please see her post here. On Sunday, Laurie will be at an author breakfast with Sarah Dessen held at Chester County Book & Music Company beginning at 9AM until 12PM. If you plan on attending, please RSVP to their Children’s Department. Come on, admit it, you always wanted to know what Laurie has for breakfast, check it out!!! Also on Sunday, Laurie will be one author out of NINE at a super event at Children’s Book World from 1PM until 3PM. The event is called “A Novel Idea”, a Teen Event/Benefit for Philadelphia Free Library’s Summer Reading Program. Philadelphia Free Library is faced with the possibility of NOT having it’s book budget restored next year, so Children’s Book World has teamed up with them to raise money for books! Go here, and scroll down to read more on the event. Seeing your favorite author and helping a local library, two great reasons to stop in to Children’s Book World. Believe me, Laurie would absolutely L O V E to see You at her events. Just tell her the Queen sent you! Ta Ta…. I revised all weekend. What about you? If you are working on NaNoWriMo or just putting pedal to the medal to finish a draft, you might want to read the Tips on Writer’s Block I wrote for the NaNoWriMo Young Writers Program. Because of the intense revision schedule I’m on, I need to issue a blanket apology to all my friends for not answering email or phone calls right now. I’d grovel too, except I’m too busy writing. It’s almost Thanksgiving and that means… The National Council of Teachers of English/ALAN Conference is just around the corner. This year it’s in my old stomping ground, Philly. 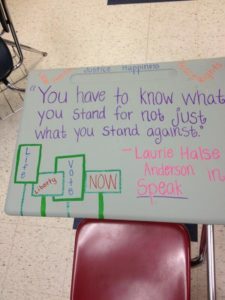 FRIDAY, NOVEMBER 20, 2009 – PUBLIC EVENT WITH JAY ASHER & LAUREN MYRACLE! 4:15–5:30 pm Panel: "Authors’ Blogs: Connections, Collaboration, and Creativity"
SUNDAY, NOVEMBER 22, 2009 – PUBLIC EVENTS!! 9 am–12:00 pm Chester County Book & Music Company Author Breakfast with LHA & Sarah Dessen! More authors than you can count at this one: Jay Asher, T.A. Barron, Sarah Dessen, Steve Kluger, Justine Larbalestier, David Levithan, Lauren Myracle, Scott Westerfeld & Jacqueline Woodson. And me!